← Day 62: Sit In a Salt Cave. Day 63: Soy Candle-Making Workshop. It’s been about a week since I made bath oils and scrubs at the Grassroots store on the Danforth, and frankly, that is just way too long to stay away from these good people. I was delighted to learn that I hadn’t missed the soy candle-making workshop after all, since it had been rescheduled to this evening. Without a second’s hesitation, I signed up. 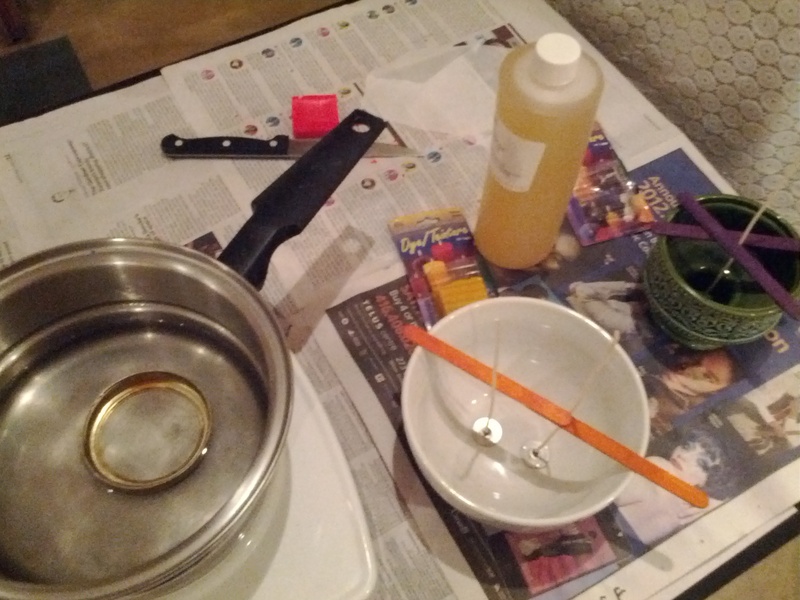 Now, other than for the blog, you may be wondering… candle-making? Really? And I would say, yep. I’ve been fascinated with them since I was a child. Okay, maybe more so with the flame, but let’s not split hairs. I’ve always been curious about things that have been around for centuries with little innovation, as though they got it right the first time, and wanted to see the process for myself. Beeswax retains oil better, making it slightly longer lasting. The verdict? Soy won out by a nose, possibly tied to the realization that the extra $5 could be put towards a yummy chai tea latte. Woo hoo! Okay, so with that decision out of the way, we got down to bee-siness in the workshop, which was led by Melissa Johari, of Positively Glowing Candles. 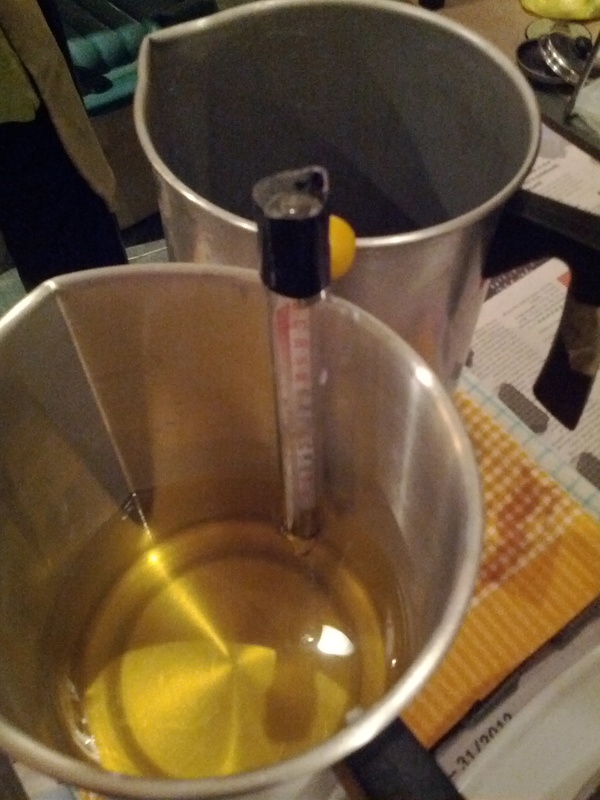 Melissa had already put several wax melting pots into double boilers on portable burners, to save some time. The next nail-biter was whether to choose soy container wax or soy pillar wax. Coupled with that decision would be our choices of container or mould, colour and fragrance. I have not had to make this many decisions in a row in quite some time. Oh, the agony! Not only that, but we also had to partner up, so it was doubly vexing. Fortunately, the sweet young girl next to me was happy enough to go along with my soy container choice, which was conveniently located directly in front of us, as well as citronella for the fragrance, which is ideal for keeping bugs away on my deck at dusk. It’s all good, though, because I let her pick the colour. See? I’m cooperative. The height of the waiting game. Then it began – the waiting game. 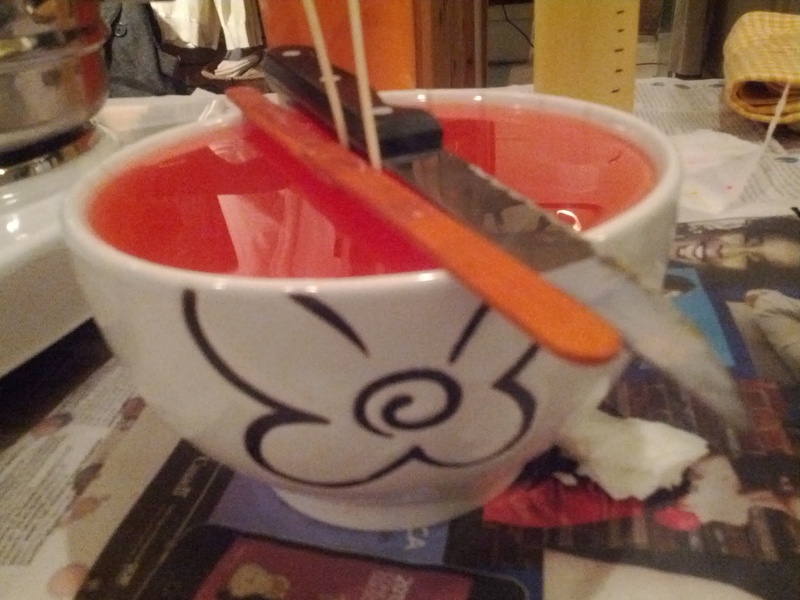 The soy container wax needed to cool to 122F before the colour chips could be added, then heated up again to 125F to pour. In the meantime, we chose our containers, and planted the wicks, trying to keep them as upright as possible with whatever means we could, including popsicle sticks. Our wax turned out to be quite finicky, but eventually, we just threw in the bits of colour, stirred like mad, and then picked out the non-conformist bigger chunks that refused to blend in. We then poured it into our containers, propped our wicks, and marvelled at the quasi-fluroscent shade of Tang we managed to create. By this point, we were well over the allotted time for the workshop, so we arranged to pick up the larger candles, like mine, later in the week, giving them a chance to cool overnight. I was a bit jealous of the smart girl across from me who opted to make the tea lights, which looked perfect. 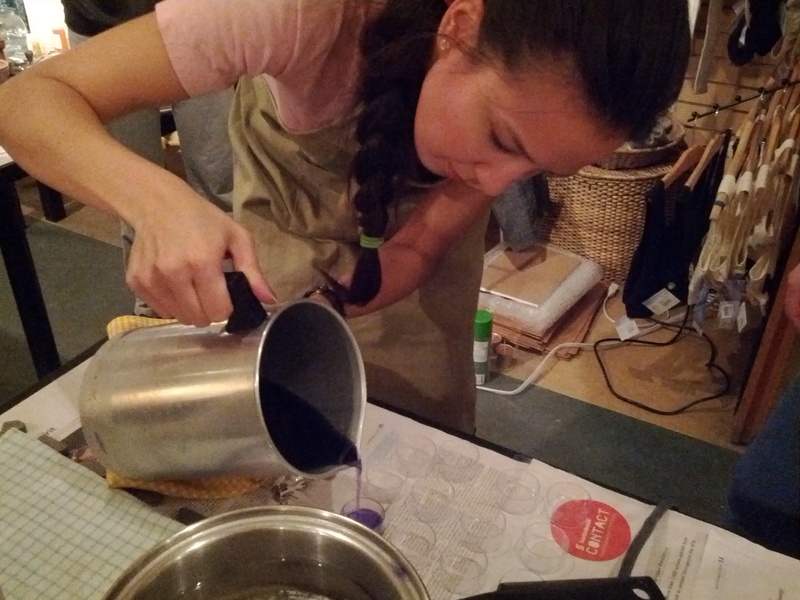 Below are pictures of the lovely Melissa, showing us how to pour the wax (safety first! 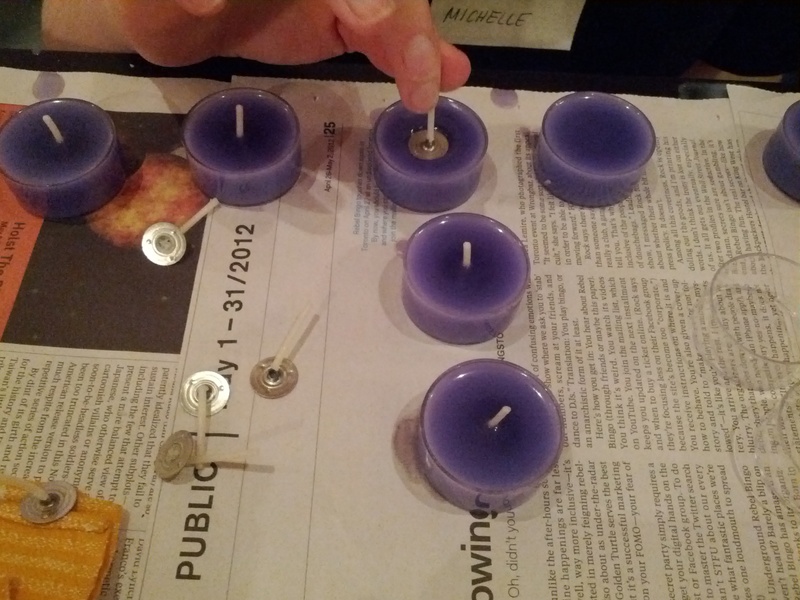 ), my neighbour inserting wicks into her tea lights (which is done after pouring and letting a film start to form), and then finally, my masterpiece. Beautiful, ain’t it? Come on, you blood-sucking mosquitos – bring it on! Unless you’re congested and can’t smell the citronella, in which case, kindly stop by a salt cave on the way. And with that, I leave you with an obscure reference to the musical-turned-movie Rent (hmm… original idea, isn’t it, Mamma Mia? 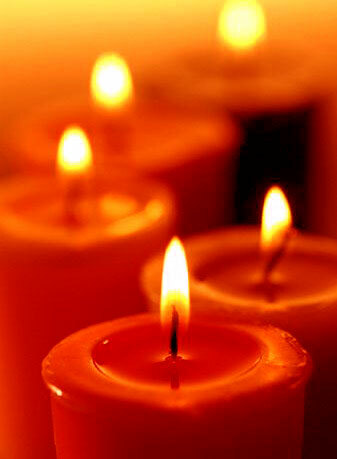 )… Would you light my candle? This entry was posted in Educational and tagged Educational, Grassroots, May, Melissa Johari, Positively Glowing, soy candle-making workshop, Toronto. Bookmark the permalink. 1 Response to Day 63: Soy Candle-Making Workshop.